Terry Price soon had Inside Golf’s sales executive David Ross on track to lowering his handicap. INSIDE GOLF went back to school last month – not the classroom variety but the Terry Price Golf Schools based at the idyllic Sanctuary Cove Golf and Country Club on the Gold Coast. Sales executive David Ross and I were keen to improve our ball-striking ability and learn how to play stroke-saving shots and Terry, who has one of the best swings in the game, was keen to impart the knowledge he learnt from the likes of Butch Harmon, David Leadbetter and Mac O’Grady. Terry Price and Sanctuary Cove are a good fit. The Cove is a world-class facility with two championship courses – Pines and Palms – first-class practice facilities, gymnasium and, of course, Arnie’s Café. And Terry is a first-class, likable, easy-going individual. On arrival, Terry joins his students for breakfast at Arnie’s to discuss each player’s expectations and goals. 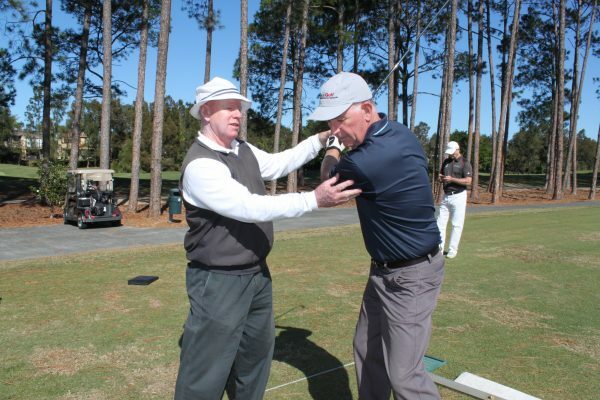 Then it’s off to the gym where Terry demonstrates exercises that can help improve areas of the golf swing before heading for the golf range and short-game practice area. Terry is articulate and explains in easy-to-understand language swing analysis, set-up, body angles, backswing motion, distance control, shaping ball flight and more. “David, what area of the game do you want to improve?” Terry asks. “I want more distance off the tee (don’t we all) and I want to hit the ball higher,” I reply. Terry tells me to achieve this I need to introduce the draw shot to my game. In his familiar laidback style that makes people feel at ease, Terry explains how to hit the shot and then he demonstrated it both right- and left-handed. “Now go ahead and hit the shot,” Terry says. Within minutes, I’m hitting a high draw. Another student’s aim was to eliminate his wicked slice and within a short space of time, he’s grinning like a Cheshire cat. “It’s about getting the best out of each individual that excites me,” Terry tells me. “The game has been good to me and I’m passionate about improving golfers’ skills. “Just a few weeks ago I was coaching a 10-year-old and the following day an 82-year-old. Inside Golf discovered the Terry Price Golf Schools is more than beating balls on the range. Terry and his team mix it up with short intense sessions on the range, at the short-game area and out on the golf course where course management comes into play. There is some psychological work where Terry shows students what their swing looks like in mirrors through Trackman and video sessions. “Trackman accelerates the learning process beyond conventional means, which we never thought possible a decade ago,” he said. The “school” experience is light-hearted and there’s even a few jokes cracked to lighten the mood. At lunch Terry tells stories about his playing days on the tour playing alongside the best players like Jack Nicklaus, Greg Norman, Seve Ballesteros, Colin Montgomerie, Bernhard Langer, Tom Watson, Adam Scott and others. I only spent a day with Terry, but I believe I left Sanctuary Cove a better player than when I arrived. Inside Golf’s David Ross said he was delighted with the experience. “After a short time on the range, Terry quickly identified a couple of issues with my club position at set-up and my wrist position at the top of the back swing,” he said. Anyway, Terry reckons his golf schools are “Perfection in Paradise” and he may well be right because golfers from Sydney, Melbourne, Brisbane and elsewhere are turning up to find out what all the fuss is about. With the Gold Coast’s mild winter weather along with the top-quality Sanctuary Cove Golf and Country Club, the Terry Price Golf Schools is the perfect setting to discover an effective and efficient swing that will almost guarantee to shave strokes off your handicap and ensure you enjoy your golf much more. Terry says evidence gathered from former students suggest an improvement rate of 20-30 per cent in a short space of time. Golfers can choose to attend three- to five-day golf schools. To ensure every attendee received maximum attention, Terry keeps group sizes to a maximum of four.